The Explorer 16/32 Development Board is a flexible and convenient development, demonstration and testing platform for 16-bit PIC24 MCUs, dsPIC DSCs and 32-bit PIC32 MCUs from Microchip Technology. It features all the necessary hardware to begin developing and debugging a complete embedded application. 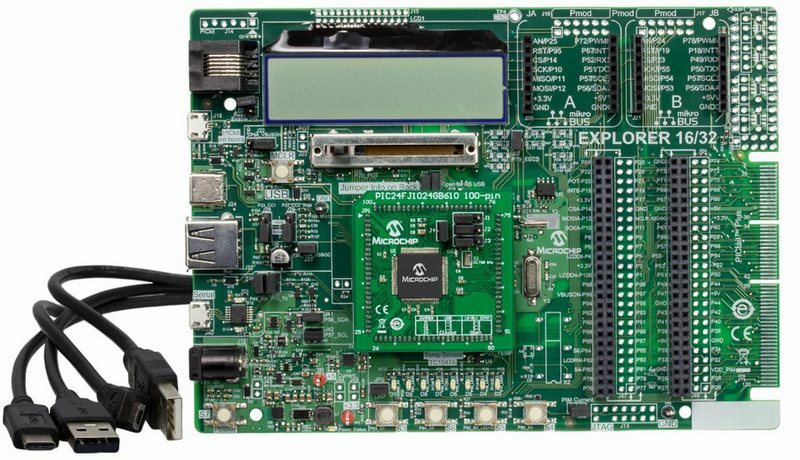 The board accepts Processor Plug-In Modules (PIMs) designed for the Explorer 16 or Explorer 16/32 development board for easy device swapping. In addition to the hardware features provided by the board, hardware expansion is possible through the use of PICtail Plus daughter cards and mikroBUS accessory boards. Coupled with the integrated PICkit-On-Board (PKOB), MPLAB ICD 3 In-Circuit Debugger or MPLAB REAL ICE real-time emulation and debug facilities enable faster evaluation and prototyping of application. Explorer 16/32 Development Board offers only the main board, giving the option to customize the other necessary components. Choose PIM of your choice based on MCUs and DSCs under consideration from wide range of Processor Plug-In Modules. This board is optimal for customers migrating from Classic Explorer 16 to new Explorer 16/32 platform, while all the necessary additional components like Processor Plug-In Modules and PICtail Plus Daughter Boards are already available. Also read about Explorer 16/32 Development Kit.